In a medium-sized saucepan, combine the sugar, corn syrup, eggs, butter and salt. 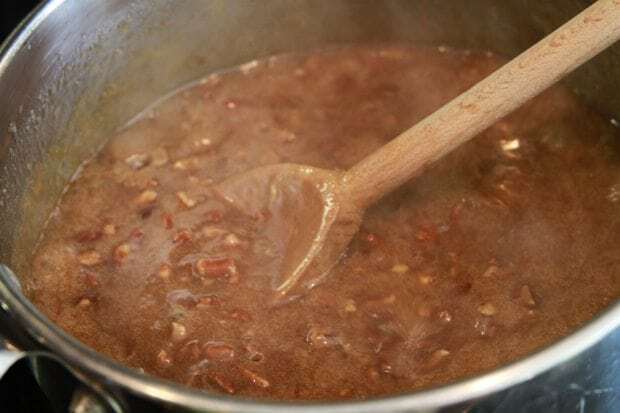 Bring to a boil over medium heat, reduce the heat to a simmer and stir in the pecans. Simmer for about 8 minutes. Remove from the heat and stir in the vanilla. Bring the crusts to room temperature. 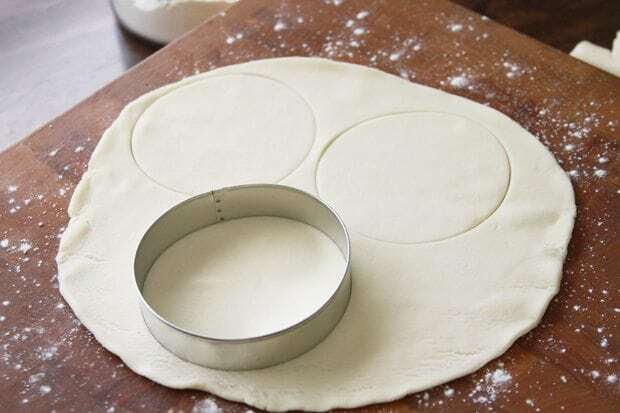 Unroll one on a lightly floured surface and cut circles using a 4-inch circle cutter. Re-roll the dough and repeat until all of the dough has been used. You should end up with about 24 circles. 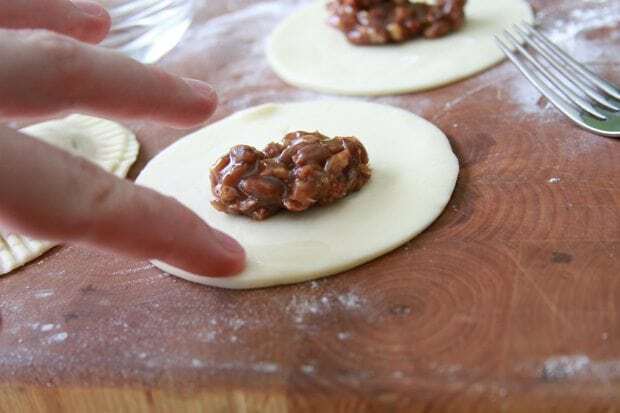 Place a heaping tablespoon of the pecan filling mixture in the center of a pie crust circle. Lightly moisten the edges of the crust with water, then fold the crust over. Crimp the edges together with a dinner fork. Repeat the process until all of the pie crusts have been used. In a large dutch oven, heat about 1 inch oil in the bottom to 350 degrees F. Fry the pies in batches for about 1 to 2 minutes on each side – or until golden brown. Drain on paper towels then lightly dust with powdered sugar. Serve warm. Be sure to check out all of the other AMAZING Betty Blogger recipes for this year’s Red Hot Holiday Trends! Place a heaping tablespoon of the pecan filling mixture in the center of a pie crust circle. Lightly moisten the edges of the crust with water, then fold the crust over, crimping the edges with a dinner fork. Repeat the process until all of the pie crusts have been used. 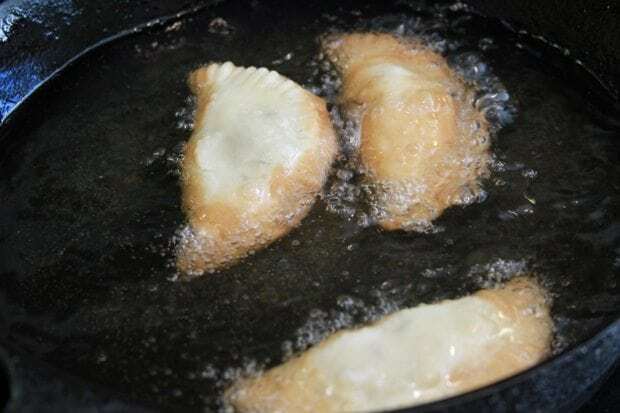 In a large dutch oven, heat about 1 inch oil in the bottom to 350° F. Fry the pies in batches for about 1 to 2 minutes on each side - or until golden brown. Drain on paper towels then lightly dust with powdered sugar. Serve warm. Hold on, I need to wipe the drool off my keyboard. These look crazy good! 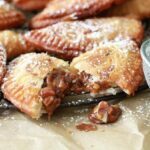 I adore pecan pie, and these little fried pies look amazing! My grandmother made the best fried pies, but I’ve never been brave enough to make them myself. Some day! Thanks, Jennifer! They are an undertaking for sure, but so worth it. I know YOU won’t have any trouble with them at all. Happy Holidays, friend! These pies look awesome! I love a hand hand pie…and fried, even better! They look fabulous, I am going to make some soon with the left over pecans we have from Thanksgiving. Yumo! Thanks, Lela! I hope you will enjoy them as much as we do. I wonder how long they would take to bake in the oven? These look great. I’m not exactly sure. You’ll just want to bake them until they are golden brown. Enjoy! I can’t even deal with how good these look! So yummy! Thanks, Stephanie! That is so sweet! Oh my-those look wickedly delicious .In order to make then just a tad less fattening-do you think that one could bake th eassembled pies on a baking sheet instead of the deep fry method? Absolutely! You’ll just want to watch them closely and bake until they are golden brown. WOW!! Fantastic recipe and great pictures. Can’t wait to make these with my Granddaughter…this will be so much fun. Thanks for a way to make memories! Merry Christmas! Thanks, Mary!! Hope y’all have fun and enjoy them! Merry Christmas to you, too!! I make pecan pie all the time for the holidays. My question is, I have some family member that are older and have a hard time with pecan half. So I blind them in the blinder to chip them up find for my pie. Do you think that would work for those little fry pies. Yep, it think it would work just fine. 🙂 Enjoy! Looks great, however being diabetic I have to watch deep fried fook….could these be baked???? Absolutely! I would simply bake them in a 350° oven until they are golden brown. Thanks for all the great messages & recipes throughout the years! Merry Christmas, Stacey, to you & yours!!! Thanks, Sabrina! Merry Christmas to you, too!! I love this…..in Spanish, a turnover is empanada…and I could eat anything that is enclosed in a pie crust! 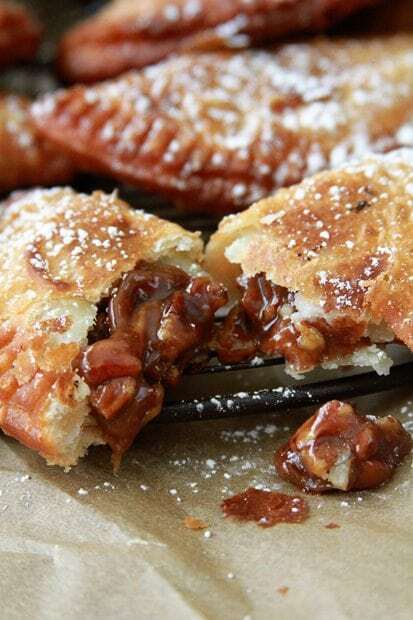 Fried pies, empanadas fritas, are the best, and when the filling is pecan…OMG! Heaven! Thank you! Thank you! Love it! Hi Jessica! I wish I could give you a definitive answer. In theory, I think it would work, but I’m afraid that the apples wouldn’t have enough time to cook through. If you give it a try, please come back and let me know!! You can take apples and cook them before you put them in the pies. try to keep them looking like apple slices add apple pie spice, sugar and butter. I think it would work. Oh my heavens, I think I’m going to faint! Quick, revive me with one (or two) of these pies!!! Stacey, I have been selling baked goods to raise money for a dance camp my daughter will be attending this summer. So far in 2 months I have raised close to $800. I am always looking for ideas and receipes to make for these sales. Do you think these pies would do okay if I fry them then put them in a bag after they have cooled to sale the next morning? If you have any great ideas or bake sale recipes, I would appreciate those too! Thanks! Hi Jennifer! Listen at you! That’s amazing! The thing about these is that they are really best when they are hot. I would recommend them for a bake sale. My Easiest Cookies Bars Ever, Pecan Chewies, and Sweet and Salty Toffee Cookies would work really well, though! Good luck! can they be served cold? I am baking for my boyfriend. These are one of those things that are really best served warm. These look amazing! Is there a link to this dough recipes? Some are too flaky and will just come apart. Thanks! I used a pre-made refrigerated pie dough. I’m tickled y’all enjoyed them! These are the absolute BEST! I’ve had to double the recipe 2x already! Kids and grandkids can’t get enough. They like taking them to school-their friends are soooo jealous! Thank s for sharing. So glad y’all are enjoying the recipe, Margaret! 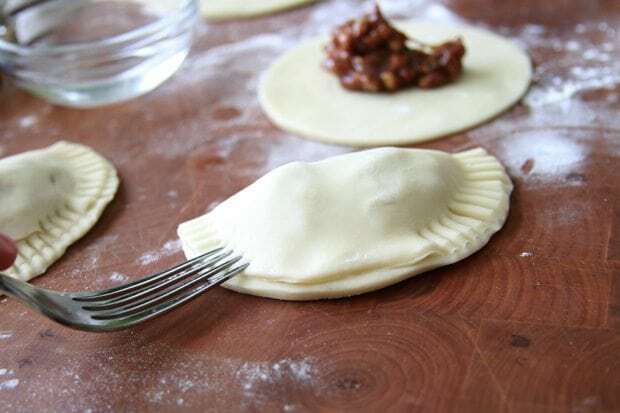 Being a Southerner, born and raised, and a Pecan Pie lover….I am soooo going to make these! Bless your heart for sharing this with us. I hope you’ll enjoy them! What is the best way to store and reheat them? 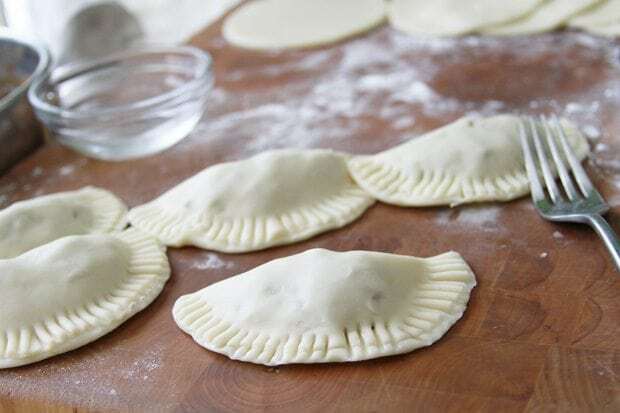 These are really best fresh, but can be stored in an airtight container and reheated in the oven. 1. Thank you for taking me back to my great-grandmother’s fried pies from my childhood. 2. Why have I never seen anything like this in my 38 years on this planet? I’m drooling and I think that I just gained 10 pounds. EXCELLENT recipe. Thanks! Ha! I hope you’ll enjoy them! Thanks for the recipe! I literally just finished making these and they are FANTASTIC!!! Going to make deep fried apple ones and chocolate filled ones as well! Wonderful! SO glad they turned out great for you! Made these for my husband last night. They were so good. I had a little filling left over and I used it as a ice cream topping. Thanks for the recipe! What a great idea! So glad y’all enjoyed them! I haven’t ever tried that. The trick would be in the frying part with those. If you give it a try, please let me know how it turns out! Can these be made ahead ? I want to try them and would love to save time. They can be made and ahead and fried when ready to serve, yes. Enjoy! Can eggs be omitted or substituted? I’m not aware of a substitute for them in this recipe. I LOVE pecan pie and I have a fantastic recipe for it, but I have never had a fried pecan pie. Oh, yeah, I’m making these!!! I’d like to take them to my club meeting for dessert, so I don’t eat all 24 of them!!! I know you said they’re best served warm–can they be reheated? Or does that make them soggy or otherwise ruin them? I think they’re best right out of the oil, but they can be reheated. Not really. They’re best served warm, right out out of the oil. 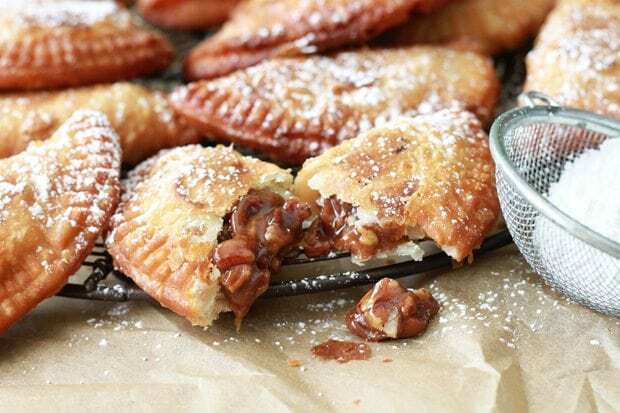 Can the pecan hand pies be baked instead of fried? I’m not physically able to stand but about a minute or so at a time.Thank you. Hi Barbara! In theory it should work, but I have to admit I’ve only fried them. Hello. Can these be mase, froze and then dry as we want to eat them? Thanks. Absolutely! Just allow them to come to room temp before frying. Best ever at Goat Rodeo restaurant in Houston. Came back to California and Googled the recipe. Making them for Thanksgiving. I don’t boil my pecan pie ingredients. Is it necessary? For this recipe it is. 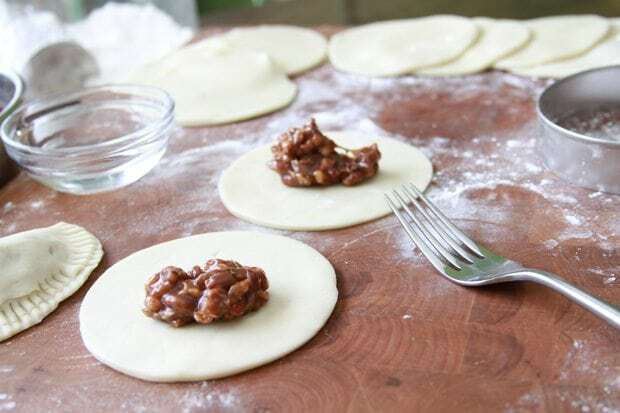 The quick cook time in the oil won’t be enough to cook the filling completely. Wonder if you could air fry these????? I don’t have much air fryer experience, so I can say for sure. Probably, though.